Founder of the Debian GNU/Linux distribution project, Ian Murdock has died at the age of 42. His death, announced in a blog post by Docker CEO Ben Golub, came after an apparent encounter with police and a statement posted on Murdock’s Twitter feed that he was going to commit suicide, though no cause of his death has been given. Ian Murdock, born in Germany in 1973, founded Debian in 1993 while studying computer science at Purdue University. The distribution gets its name from the combination of his name and that of his then-girlfriend Deborah Lynn. The pair married, and had two children; they divorced in 2007. Murdock’s Debian Manifesto railed at the poor software maintenance of other Linux distributions of the time—and that of Softlanding Linux System (SLS) in particular, bemoaning the lack of attention developers gave to distributions and what he saw as the big cash grabs being made by would-be commercial Linux developers. He outlined Debian’s modular architecture approach as well as its adherence to free software philosophy. After earning his Bachelor of Science from Purdue in 1996, Murdock became Chief Technology Officer of the Linux Foundation. In 2003, he brought his experience with Debian to Sun, where he was Vice President of Emerging Platforms. He led Project Indiana, the effort that created the OpenSolaris operating system, which he described in a 2007 interview as “taking the lesson that Linux has brought to the operating system and providing that for Solaris as well.” But three years later, after Sun was acquired by Oracle, the plug was pulled on OpenSolaris in favor of a new proprietary version. After the Oracle acquisition, Murdock resigned his position at Sun. In 2011, he went back to Indiana to join the cloud software company ExactTarget as its Vice President of Platform and Developer Community. The company was acquired by Salesforce in 2013 and became Salesforce Marketing Cloud. In November, he left the company to join Docker in San Francisco. His Twitter account had since been deleted. However, at that time, some people speculated that Murdock’s account had been hacked and that the tweets were not by him. 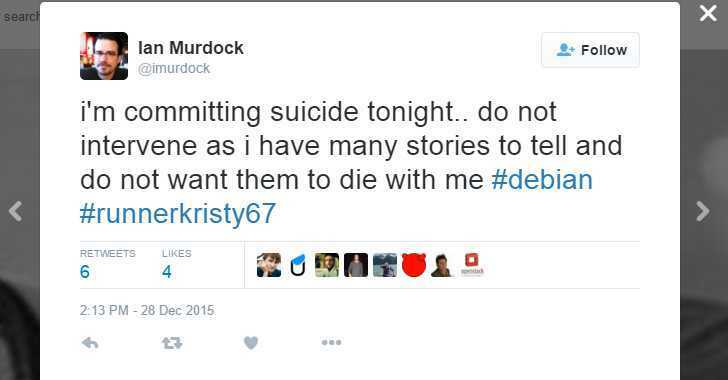 Also on Monday, Murdock wrote a string of posts that indicate he had a confrontation with police. Inquiries to the San Francisco Police Department by Ars went unanswered. Public records indicate Murdock was arrested on December 27, and released on bail by the San Francisco County Sheriff’s Department, but no details were available on the charges.